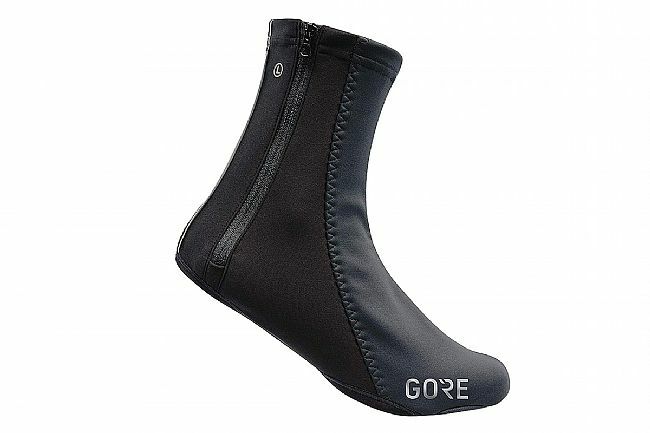 The Gore Wear C5 Windstopper Overshoes are ideal for the cold season. Extremely lightweight, these overshoes use Gore's Windstopper fabric to keep your feet wonderfully warm. They fit snugly on shoes for a close fit. A zipper on the back makes for easy off and on. Two cutouts in the bottom feature reinforced seam for increased durability and walkability. Elastic back for maximum comfort and fit. Soft and versatile Gore Windstopper product, windproof, water repellent, and highly breathable. Reflective logo and piping for improved visibility in low light conditions. Zipper closure on outer back of shoe cover for improved fit.